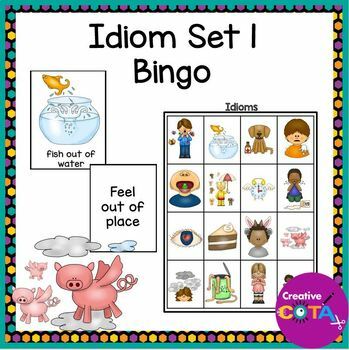 This is a set of 12 different Idiom Bingo boards (16 space). Also a blank sheet and cut an paste idioms is included to make boards for larger groups. People say the funniest things. 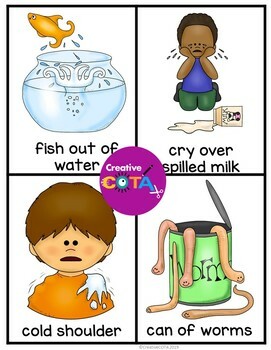 Can your students figure out these idioms? Idioms included: I'm all ears, when pigs fly, time flies, sick as a dog, raining cats and dogs, piece of cake, in the same boat, hold your horses, head in the clouds, frog in the throat, fish out of water, cry over spilled milk, cold shoulder, can of worms, butterflies in my stomach and apple of my eye. 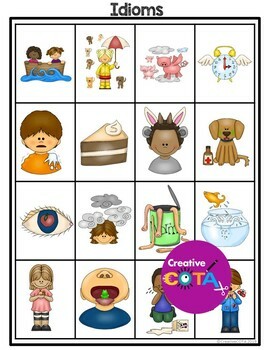 Print and Laminate bingo boards. Use calling cards to call out idioms for bingo, or for a memory or matching game. For an added challenge, describe the meaning of the idiom and see if the students can find it on their board. To cut down on competition between my students. I designed boards that will be fully completed at the same time. Use this link to find more idiom resources in my store. Click HERE to follow my store. You will receive emails about new resources. Purchase new resources within the first 48 hours of upload and receive 50% off! Thank you. Please consider rating all downloaded resources. Providing a rating for paid resources will earn you TpT credits. Credits can be used toward your future purchases on TpT. Your ratings are helpful when creating new products and I can also update any current product based on your feedback. My hope is that you are 100% satisfied and feel you can give the product a 4 star rating. If not, please send me a question/comment if there is something I can do to improve your downloaded purchase. Click and go to your My Purchases page now to provide a review for resources you have purchased. Sales, ratings and new followers make my day. Thank you in advance for your time.